Asynchronous Head-Head Real Time competition Even though both players are not using their iPhones at the same time, a player can compete as if the other player is playing in real time, head-head. This is completely different from turn based non-real time competitive play, and is accomplished by "summoning persistent ghosts" that persist in the world and can be challenged by other players even when the ghost's player is not actually on their iPhone. Playing against a ghost is exactly like playing in real-time against a real player, with real-time interaction between challenger and ghost. World Newsfeed All players see a continuous stream of real-time events happening in the World all the time, as a ticker on the bottom of the iPhone touch screen. Touching an "interesting" event in this ticker takes you to a new place in the world called the Tavern, where players can conduct "asynchronous" chat with other players in the world, propose duels, share strategies and compete for leader board rankings. Player Walls Each player gets a wall where other players can leave comments and challenges and suggestions, which in turn become events in the Tavern. "We've raced to be the first Asynchronous Mobile MMO, or AMMMO, specifically designed for "distractable" environments such as the iPhone. Game play is bursty, interruptible, and you don't know exactly when to expect your friends to be online. Yet even our casual gaming fans wanted massively multi-player capability and told us they would pay for it: so we built this AMMMO World and are thrilled by the positive feedback we've received in the beta cycle." said Jason Citron and Danielle Cassley. 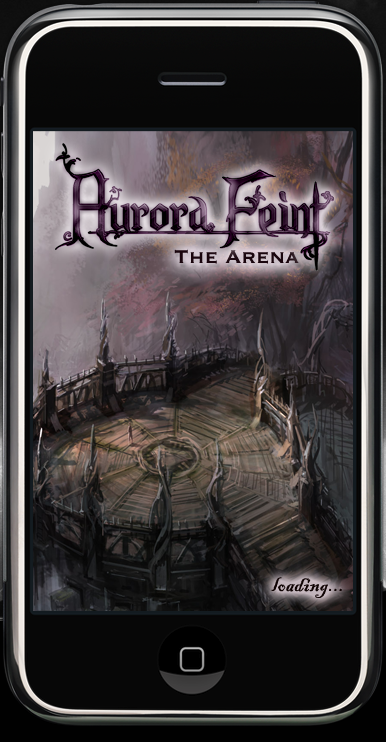 Now the only question is: Do you buy Aurora Feint II: The Arena now, wait for Puzzle Quest in December or pony up $20 for both?